Today was all about the senses, one of those days that will stay imprinted in our memories for a lifetime. Sight — We were greeted on our way into the park by two groups of Rocky Mountain bighorn sheep right next to the road. Usually you see them up on the mountainside but we guessed that the salt on the roadsides in the winter might have brought them down next to the road. One of the most overwhelming sights of all was seeing the steam come up from the snow covered hot springs on the Mammoth terraces. The trees and grasses next to the springs had ice covering them from the steam that froze onto on every branch and needle; it was hauntingly beautiful. We saw thermophiles, bacteria that live in the hot springs and are different colors based on what the temperature of the spring is, each different bacteria having a different color. Seeing a salmon-colored sunset over a snow covered plain was awe-inspiring this evening, especially with bison silhouetted against the background of a colorful twilight sky. Smell — The smell of sulfur at the hot springs is one you would think would be rank, but it isn’t at all when it blends in with this environment. The cold air smelled crisp, light and fresh. Coming back to our hotel after an afternoon in the cold made the fire in the fireplace smell warm and inviting. Sound — The sound today was a crunch crunch as we walked over the snow. At the hot springs you could hear the bubbling of the water as it emerged from the ground. The peeping of a Townsend’s Solitaire (related to robins and bluebirds) from the top of a dead tree ended a great visit to the terraces. Silence, a total silence, was the loudest thing we heard all day and was a welcome contrast to the swishing of our ski pants. Touch — The cold on our faces was refreshing and since there wasn’t really any wind, it felt good, not harsh at all. Holding our hands over the hot springs (not touching them) warmed the cold tips of our fingers. Some of us were lying on the ground taking photos and we could feel the heat through the ground warming us. Taste — A bit of dry snow in the mouth was really cold but the warm goat cheese at lunch was terrific! Some of use experienced wild game chili, bison tacos and an elk burger. Not your average lunch room fare! 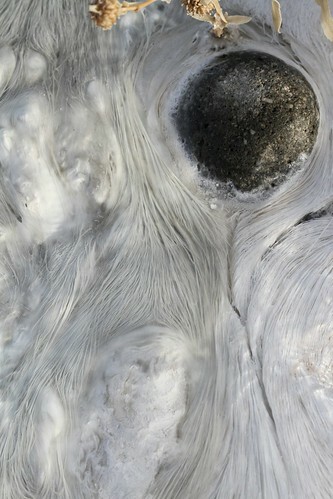 How cold was the weather yesterday in Yellowstone?? How deep is the snow in Yellowstone now? How do the hot springs stay hot? Hey guys! Great questions! Iam looking forward to hearing about all of your research when I get back. We saw more wolves today, 15! We are going down to old faithful tomorrow and I am very excited! Take care and see you Wednesday! The high yesterday was around 20 degrees Fahrenheit. The low was about 6 degrees. Pretty chills, especially in the shade! There has been less snow this year than most years. Right now there is only a couple inches here at Mammoth and about 17 inches where we went snowshoeing in Silver Gate. 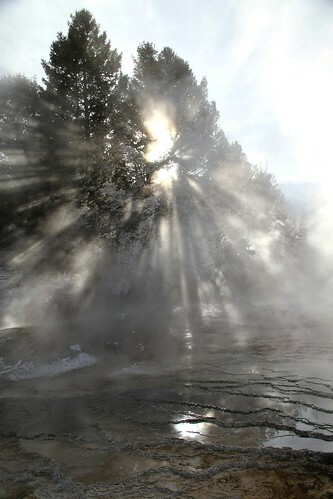 The hot water in the springs is heated by the magma chamber deep underground and isn’t affected by the surface temperature. It seems so amazing… like a whole new world in Yellowstone! What is the tallest mountain called in Yellowstone? 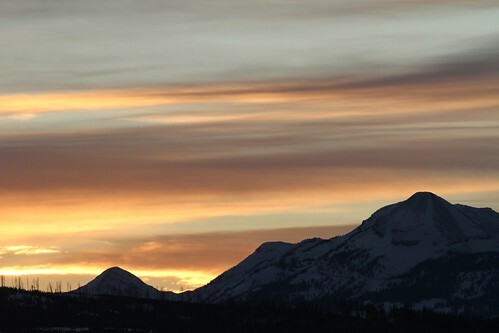 The tallest mountain in Yellowstone is Eagle Peak at 11,358 ft. It’s located in the southern half of the park, near the east boundary.